THERE’S STILL no resolution to the war in Washington over Frank Gehry’s design for a memorial to General Dwight D. Eisenhower. 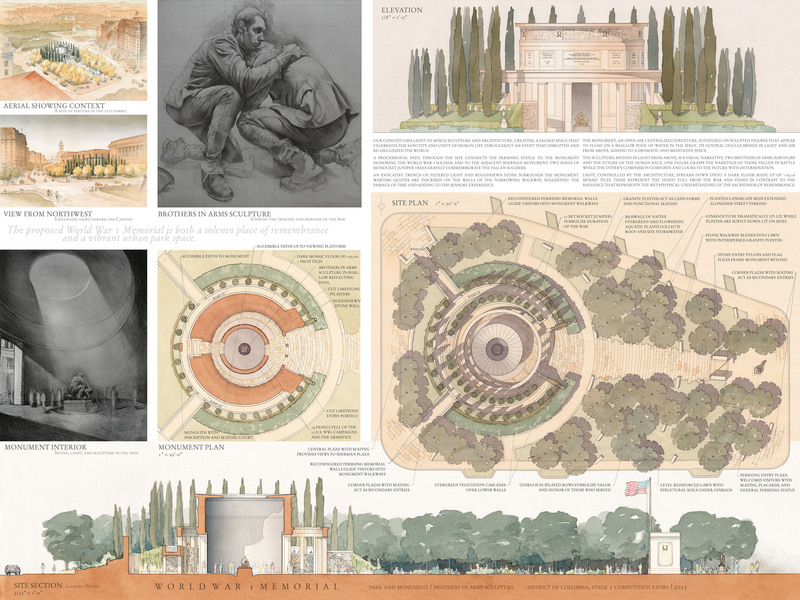 Many who love Gehry’s work hate the memorial design,* which the Eisenhower family rejected. But Kansas Senator Bob Dole and Kansas Congressman Pat Roberts (What’s The Matter With Kansas?) are calling in favors and pushing to build the monument while there are veterans of the war alive to see the monument. 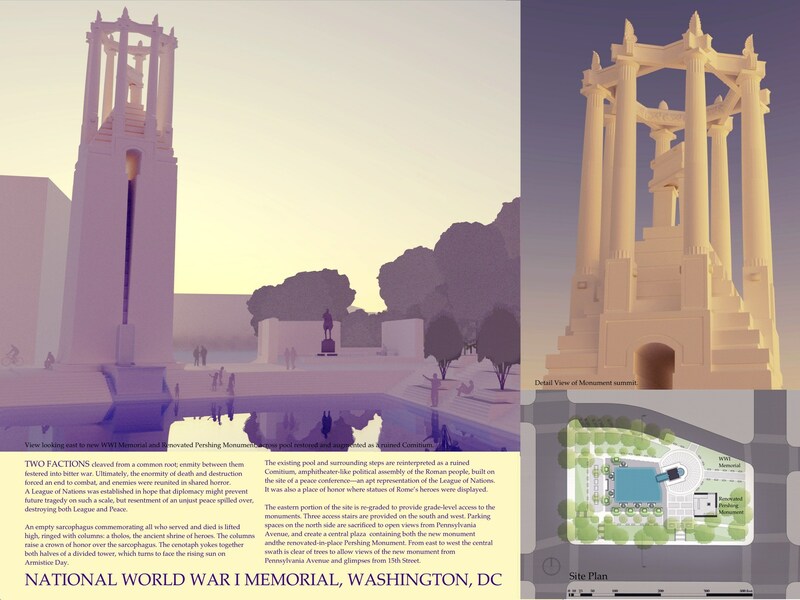 Meanwhile, all the entries in the first round of a competition for a national World War I Memorial in Pershing Park have been put online. The three best, in my opinion, are all Classical. A friend calls Park of Remembrance “undercooked,” but perhaps it’s appropriate for a block in the center of the city (Maya Lin’s competition-winning Vietnam Memorial alongside the Washington Mall is also very quiet, but that came during a quieter time in architecture). Remembrance and Honor is more attention-grabbing. After the ideological battle lines that were drawn over Gehry’s Eisenhower memorial (less by the critics than Gehry’s supporters), it will be interesting to see how these three fare. I don’t see any other entries in the competition that are as good. Like most of the critics, I think Gehry could design a great memorial—but he hasn’t (he prides himself on his experimentation, and sometimes experiments fail). Similarly, we shouldn’t exclude these three World War I designs just because they are Classical. All should make it through to the next round, when selected entries will be further developed. DC Fine Arts Commissioner Alex Krieger, a professor at Harvard’s Graduate School of Design and a friend of Gehry’s, said during a Commission meeting that if we judge the design by the standards of a “traditional first-semester architecture exercise… this would fail.” And each new version of the design has made it worse, Krieger added. 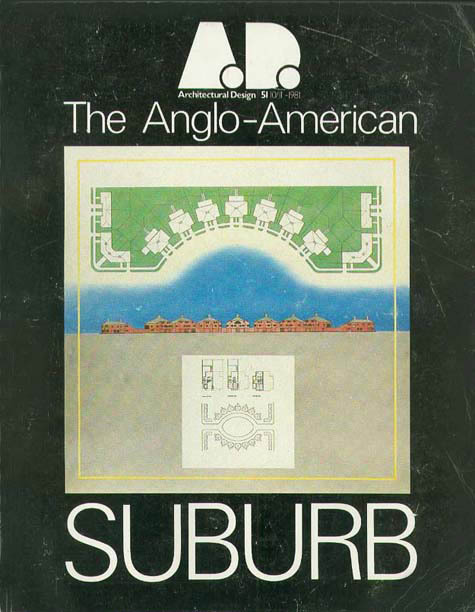 This entry was posted in Architecture, Beauty, Classical, Culture, Current, Egotecture, Good Kind, Urbanism. Bookmark the permalink. “Remembrance and Honor” is very smart indeed, and impressive in the economy of means to a very striking, confidently urban, end. 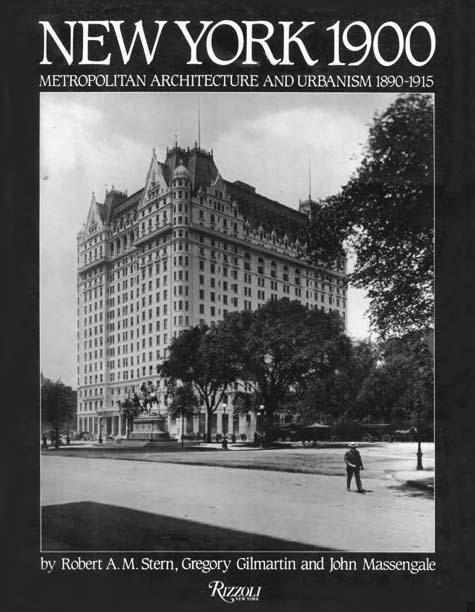 For a couple of years now,I have been … well, I don’t know what the best word is, but it is somewhere between bored and irritated, by the current course of architecture forcing people to be extravagant even if they don’t want or need that. I think there is a fatigue with “originality” now and an interest in the modesty of an artist. The central sculpture could easily stand alone. Depicting the horror, compassion and hope of the time. Two figures in their embrace radiating the feelings of humanity at war. Bringing the magnitude of war down to grasping size. The surrounding architecture an echo chamber with the park emphasizes the continuation of life. — In comparison all that can be said is; “Brothers in Arms” will be a memorable emotional experience. The project, Brothers in Arms, moves me the most and is my first choice. It captures the essence of a soldier’s concern , his comradeship for his fellow soldiers, his determination to support his brothers in arms, and this commitment without reservation is blessed by the glorious light streaming down from the heavens. In a world that is crumbling and hoping for a new and better one to emerge, comradeship is paramount and reveals the nobility and humanity of mankind. The project is at once elegant and poignant. Mankind, not war, is glorified. World Landscape Architecture has a post on the competition. These were also my top three after looking through the proposals. Experientially, “Brothers in Arms” would be the most powerful. You missed one of the better, if not the best design in the classical style, 0076 In Flanders Fields, I feel this fits in very well with the urban architecture of this area of Pennsylvania Ave. with numerous educational vignettes and what would appear to be a dramatic full size bronze war trench scene, seems to be visible from ground level and from the inside of the structure, where you can look straight down into the hell or war. That one gets my vote and the votes of my history class. “Brothers in Arms” has some very good presentation drawings which gives it a lot of appeal but after studying the plan, I felt creeped out by the blind corner walkways and long, tall trenches. Perhaps claustrophobia is part of its message but I don’t like feeling like I could get mugged on the walkway. If I can’t see around the corner and no one else is around, I’m probably not going- but that’s probably just me. I grew up remembering that DC was the “homicide capital of America”. “Park of Remembrance” seems undercooked in some areas but at least the plan is open and no enclosed areas and blind corners are minimized so far as I can see. 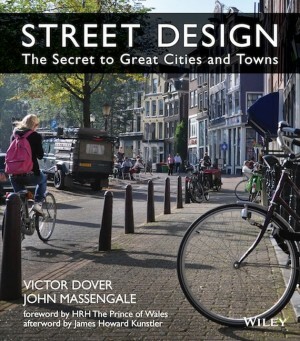 It’s more permeable space than the destination-thinking offered by the other two. JM, I think your Rem K. quote speaks to this kind of quiet humility. Certainly some potential here. If nothing else, it feels safe. “Remembrance & Honor” is certainly attention-grabbing. It might appeal to both Modern and Classical camps since it falls gracefully into neither. 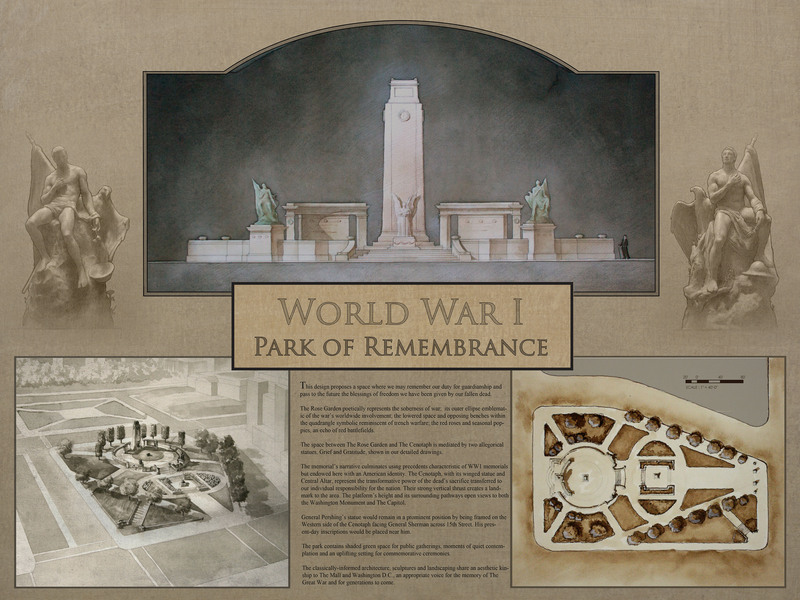 It’s certainly a memorable memorial design. One of the benefits of this design is its lean toward keeping the park’s pool and fountain as-is (at least formally). My concern is that its strengths are also its weaknesses. I wonder if its novelty would lose its appeal after a while. As you mentioned about Gehry’s experimentation, it’s difficult to tell whether innovative ideas will take root or die over time but this might be worth a shot. As I think into the future, the quiet one speaks to me more. I think Remembrance Park has more lasting public appeal than the others and it doesn’t have the hangups the others do. It might be less exciting or novel but that might also be a great asset when considering its lifespan. My working assumption is that Classicism is about the ideal- the spiritual essence of the thing. My question is: Which one of the 350 entries best describes or evokes our national attitude towards WW1 and war in general- at least the ideas we should strive to have? Whilst I agree that classic and timeless design is certainly more appropriate for this setting/context rather than highly modern or abstract interpretations of the brief, I can’t agree with some of the suggested favourites. For example I Find it difficult to make the connection between Roman columns/Roman Statues and WW1. While a number of the buildings around Washington use this style they were most likely built in a time when that style was more relevant. I consider that new memorial and associated urban park should reflect the present day architectural forms whilst being simple, elegent robust enough to allow adjacent a forms to change and develop without impacting on its relevance. A number of the submission achieved this. I fear that by trying to be too classical there is a risk of creating something fake.